YouTube can be a confusing topic for artists distributing their music online. Depending on whether you have your own channel that you upload music to, you may or may not want to distribute to the platform. Here is a brief breakdown of what the different YouTube services are, and why they exist. When delivering any media to content ID, YouTube essentially stores a digital fingerprint of that piece of media in its database, known as a reference file. This is stored together with the metadata for that piece of media in a container known as an asset. The purpose of this is so that YouTube can detect when your music has been used elsewhere. Every time someone uploads a video to YouTube, the audio and video content is referenced against the content ID database. If any of the audio or video in this upload matches another existing reference file, a policy that has been set for that asset is applied to the uploaded video. Unless specified, a distributor will generally set your music to be monetised on YouTube. This would mean that adverts will be placed on the uploaded video, and revenue generated from those adverts will be paid back to the owner of that asset. For example, if someone uses an artist’s music as a backing track to a video, content ID will detect the music used and monetise that video (known as claiming the video). The distributor will then pay revenue generated from this back to the artist. If one of your videos is claimed on you will receive an email from YouTube letting you know. If you want the distributor to monetise on this video you don’t need to do anything. Alternatively, if you want to monetise the video yourself, then you can ask the distributor to remove the claim or whitelist the channel (making it immune to claims from the distributor). Without a method of monetising the video yourself, however, you could be missing out on a potential revenue stream. Another YouTube service is Art Tracks, which creates an audio only video of your track on the platform. These look like the image below, and are listed under Topic channels. These videos are created to ensure there is a way to listen to music on YouTube, regardless of whether the artist or label has posted it in the form of a music video or not. Topic channels exist to group videos with a certain theme together. These could be in the form of genre or artist channels. For example, a hip hop track may be included under the hip hop topic channel. These channels are automatically generated and a video can be laced under any channel the music is relevant to. While this is a handy thing if you aren’t on YouTube, an artist may not want to send their music to Art Tracks if they intend to release the music on their own channel. This could confuse fans and take them away from your own uploaded video. If you do want to have your releases on Google Play though, you will have to send it to Art Tracks and YouTube Music also. This is due to a new effort by Google to consolidate all of their services. 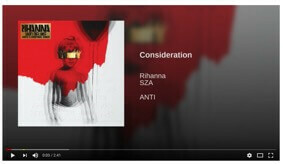 A more recent offering, YouTube Music is a streaming service with a twist. In addition to music, this allows you to stream music videos on YouTube, with playlists organising these videos into different moods and genres. This can be downloaded as a mobile or desktop app, and also updates your recommendations based on what you have previously listened to. While YouTube Music is free for anyone, it includes ads and the screen must be left on your device in order to continue listening. Listeners can also pay to upgrade to YouTube Music Premium, which removes ads and allows background listening for a monthly fee. Like any streaming service, revenue earned from streams is then paid back to you by your distributor.